WARNING! Mouth may water and appetite may increase after reading this post. Good food ahead thanks to Krystal from Recipes Of A Cheapskate! 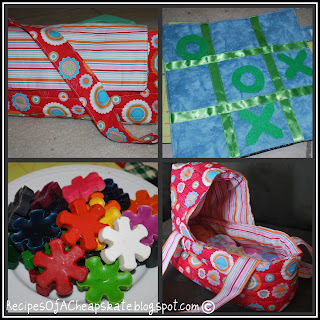 I am SO EXCITED to be here guest posting on 12 Crafts Till Christmas. My name is Krystal, and I write a little blog called Recipes Of A Cheapskate. 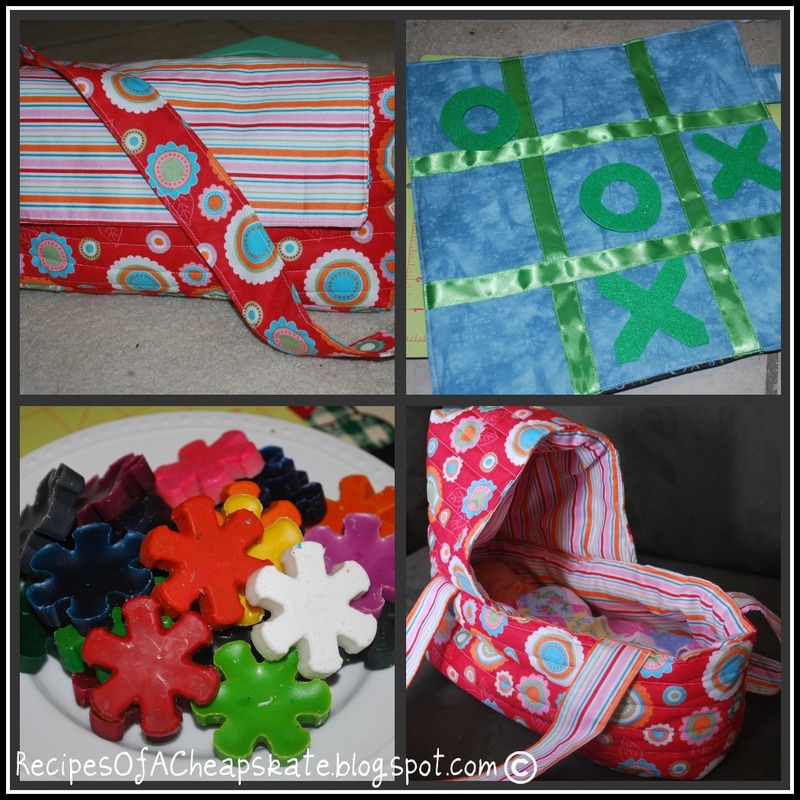 When I discovered 12 Crafts last year, it helped me so much in my desire to have homemade gifts for Christmas. I got started right away!! In my blogging efforts, I have the support of my dear husband, Captain Jax, and two little kidlets--K-girl, who just turned 3, and Baby M, who is almost 11 months. They put up with me trying new things in the kitchen, and usually eat what I make. As long as there's no onions!! You'll occasionally see me post things regarding Baby M, my preemie boy who was born 11 weeks early last year. He's 100% tube-fed, and I'm finding it's very difficult being a mom who loves to cook, having a baby who doesn't know how to eat. On my blog, you can find all sorts of good recipes, that aren't going to break the bank. I don't like spending an arm and a leg at the grocery store (who does?) so I often have recipes that use ingredients that I can store on my shelves, grow in my garden, or freeze. I love being able to freeze a good meal for a busy day!! I have some yummy appetizers you can cook up just in time for Super Bowl Sunday! And some grilled recipes for when BBQ season kicks off! As well as your every day dinners when you just need to pull stuff out of your fridge and pantry. That's the type of recipe I'm going to share with you today, something quick and easy (and freeze-able) that you can make on a busy weekend night. This recipe came about in my desire to have more meat-less meals. Cutting the amount of meat you eat, cuts down on the money you spend at the grocery store. Always a plus! I have a chicken version, that Captain Jax loves, and he loved my spinach artichoke cups, so I thought I could combine the two of them into something wonderfully tasty! And it was!! 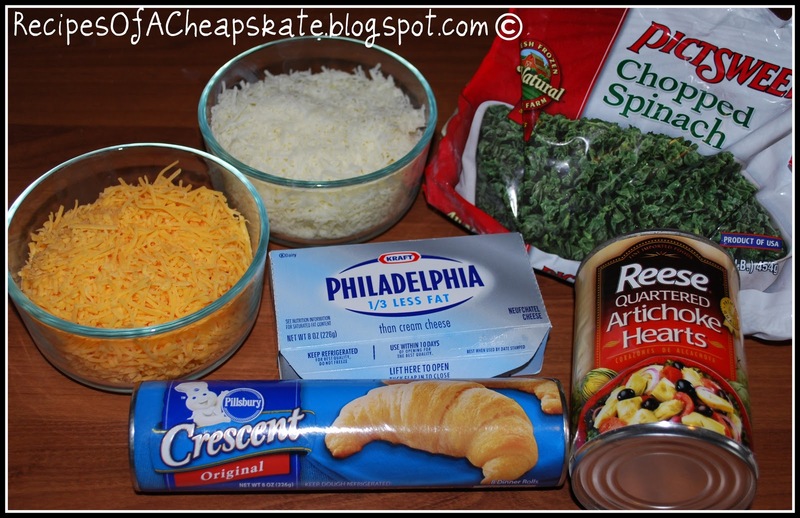 The ingredients are things I keep on hand in my fridge and pantry--some shredded cheese, cream cheese, canned crescent rolls, spinach, and artichoke hearts. The process is simple as well. Combine the softened cream cheese, the shredded cheese, spinach, and chopped artichokes in a bowl. Add your favorite seasonings (we like garlic, and Italian seasonings) and mix it all together. Unroll your crescent rolls and divide them into the separate triangles. Stretch the rolls out a little big, and add a spoon-full of the mixture. Seal up the dough around the mixture. Make sure you get everything sealed up good. Even if you think you got it sealed though, it's probably NOT, and will ooze out during cooking. Or maybe I just like to overfill everything. :) When all your rolls are finished, dip them in some melted butter, and then roll in breadcrumbs. 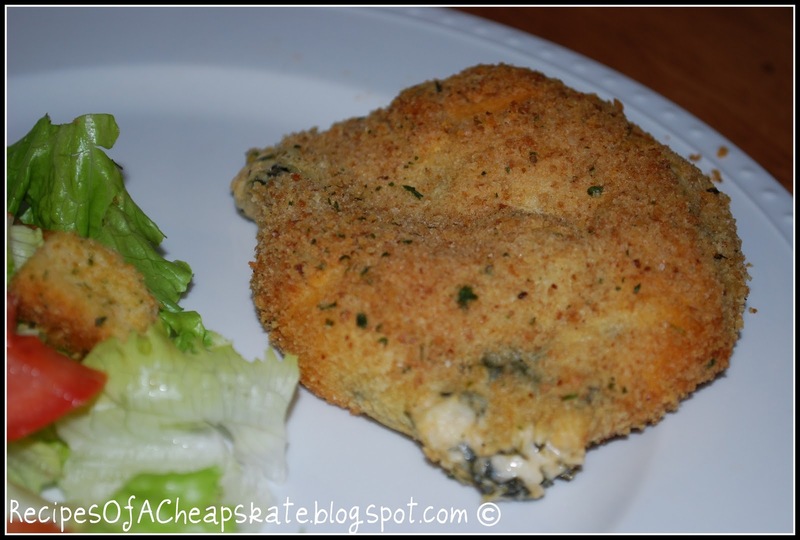 Bake them up, and serve them with a nice green salad. There ya go! Dinner, quick as a wink. I also wanted to share with you my weekly link-up called Saturday's Party that EVERYONE is invited to come LINK UP every week with your party ideas!! I don't care if it's crafts, decor, gift ideas, or food, ANYTHING related to parties is welcome!! Preheat oven to 350degs. Mix together everything but the rolls, butter, and breadcrumbs. Add your favorite seasonings (like garlic, Italian are very good). Roll out your crescent rolls, and divide into the triangles. Take each triangle, and kind of stretch it out with your fingers. Place a spoonful of the mixture on the roll, and wrap the roll up around it, sealing everything inside. Things will still leak out when it's cooked, it's the nature of the beast. :) Roll each bundle in melted butter, and then breadcrumbs. Bake about 1-2" apart on a baking sheet (these spread a little bit). Bake for about 25-30 minutes, and serve warm! Thanks so much for letting me be a Guest Blogger Elizabeth!! It was lots of fun to create something special for your readers. Come on by and visit Recipes Of A Cheapskate! No, thank you Krystal for this fabulous addition to my recipe box! ooooh! saving this recipe for sure! i love artichoke stuff. 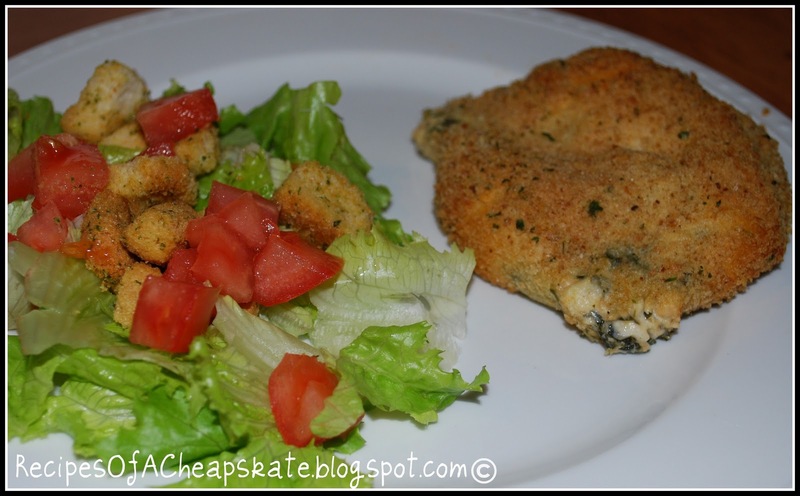 i might even make it with my artichoke chicken! What a great recipe! I can't wait to check out the rest of Krystal's blog and add her to my blog roll!! :) Thanks for sharing!! I would like to use every topic from this website. In these topics, I have found so many methods and they are making a lot of services. Everything I have read from these blogs, custom essay and thanks for updating those services.